378 pages | 5 B/W Illus. This book provides an overview of qualitative research models and their applications in organization and management studies. Focusing on the philosophical underpinnings and practical implications of diverse qualitative methods, this comprehensive text offers a guided tour of the options available to qualitative researchers, highlighting aspects of research design, execution, and analysis in each tradition. In clear, readable prose, the author offers insight into the ambiguities, tensions, and interconnections of diverse qualitative research traditions without resorting to oversimplification. The book’s four main sections include examples and applications specifically designed for the field of management. Each chapter is devoted to a specific methodology, describing techniques and applications as well as current controversies and emerging issues. Summary boxes and practical examples will help the reader to navigate this terrain and generate research that is both relevant and of high scholarly quality. With its detailed and easy-to-understand coverage, this will be the text of choice for students working with qualitative methods in organization studies, consumer research, public administration, information systems, and media and communication studies. 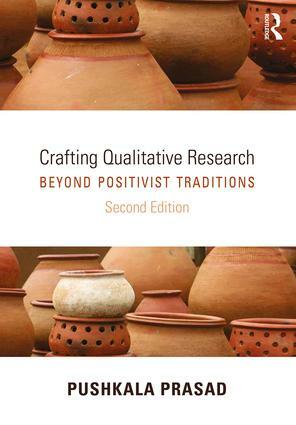 Instructors teaching qualitative approaches in a research methods course and researchers wanting to acquaint themselves with non-positivist traditions will also find this a useful resource. "Combining the philosophical foundations and methodological practices of most major contemporary qualitative research traditions with sound advice and encouragement, Prasad's book is essential reading for graduate students, professional researchers, and reviewers seeking to make vital intellectual, practical, and critical contributions to the business disciplines." "With its remarkable breadth of perspective, this book is a superb choice to anchor graduate courses in qualitative research methods across a wide array of fields. Complex theoretical material meets vivid illustrations of projects drawn from multiple disciplines—an impressive feat. The result is a compelling, accessible account of the many postures that animate qualitative inquiry." "This wide-ranging compendium of qualitative methods makes a substantial contribution to understanding and conducting qualitative research. It will be extremely useful to beginning and advance researchers, alike, as it reveals both the strength and diversity of research and shows not only how to conduct and interpret qualitative research, but how to productively think about it." "This wonderful book offers a sophisticated yet accessible map for exploring the complex terrains of qualitative inquiry. It is elegantly written and informative, without drowning readers in detail. It demonstrates the craft of academic work at its best and captures the essence of doing qualitative research. Prasad’s book is a gem." "Prasad has done it again! With this revised edition, she has produced a real treasure trove of a resource, one that synthesizes a mass of work across interpretive, structural, critical and ‘post’ traditions. There is something here to be learnt for all scholars, from beginners to old hands. Try and get your hands on it." "This book is one of my touchstones. It is unique in its approach to understanding the relationships between social science theory, research philosophy, and methods. The author's sophisticated yet accessible explanations and carefully chosen examples convey her passion for interpretive, qualitative, critical, and poststructuralist research as skillful, imaginative craft." Part IV: Traditions of the "Post"
12. Postmodernism: Playing with Images and the "Truth"
Pushkala Prasad is the Zankel Chair Professor of Management and Liberal Studies at Skidmore College, USA.